*NEW* PD Planet - free NLP eBook, 6 week e-Course and free videos! > Why is Goal Setting Important? > What is a Swish Pattern? > Does Money Bring Happiness? - an unusual, brand new product I stumbled upon a couple of weeks ago, which can help you to perform to the best of your ability and feel awesome while you do it. I've had amazing results with it, finding it helps me to get into "flow state" quickly and easily. Naturally, this has caused me to see some awesome results in my business and personal life. I'd like to see you do the same! Xphirience is a meditation aid with a difference - it uses Bliss Coded Technology and The Golden Ratio to induce powerful meditative states. The Golden Ratio is a mathematical principle found throughout nature and the natural world - and the clever dude behind Xphirience has found a way to turn this pattern into sounds which impact the human energy field. The effects? Mind blowing meditation, and a complete sense of flow. The major difference I've found between this tool and binaural beats / isochronic tones is that it seems to induce a state of flow, or being "in the zone", with no conscious effort whatsoever. Are you fed up with mere glimpses of "flow" state? Do you want to get "in the zone" whenever you want? Are you ready to start reaching your potential? If you could use a tool to get you in flow, would you? If so, consider buying Xphirience now. It's not expensive (from 15-35 euros, around $20-45 USD) and it will blow your bloody mind off! Near instant access to "flow state" aka "being in the zone"
Like what you see? Check out Xphirience now. If you regularly visit Personal Development Planet, you'll know I'm a big fan of isochronic tones. I use them daily to help me meditate, relax, and visualise. Whilst I still love my iso tones, I have to say that Xphirience is an entirely different beast. It still gets me in deep, timeless, meditative states, but as mentioned above it does something even cooler than that... it takes you into flow! "a state in which the person is fully immersed in what he or she is doing by a feeling of energized focus, full involvement, and success in the process of the activity..."
Basically, do you know them times when you have performed at the top of your game? When you lose sense of actually trying to do anything, and just let go and find yourself acting like a pro? When you lose hours concentrating, but feel that only minutes have gone by? That's flow, although sports stars are more likely to talk about being "in the zone" (same thing though). When you're in flow, you perform better, and you enjoy it more. Boom. Although this isn't advertised on Xphirience's website, I've found that these MP3s get me into flow state. What's most surprising is that I wasn't expecting it in the slightest - but yet after using them, I feel like I'm performing sharper, better and have more fun with whatever I'm doing. I don't know WHY it works, but it does! I've been looking for a tool to help me access flow state for years. Now I've found it, I'm thrilled. If YOU want to get into flow more often, this is the best option. By now, if you're excited about imagining a life full of flow state, here's the entire range of Xphirience MP3s, available for instant download now. 33 minutes long, this is the original recording. The sound is a little unusual, the effects are awesome, and you'll be in a meditative flow state within minutes of trying it out. If you're 50/50, opt for this cheaper option. 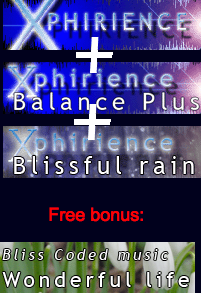 Instant Download - Get Xphirience Now! This includes the original recording (above), plus a special recording to use beforehand. This added recording is specifically designed to get you into a state of brainwave synchronization. This is the state of creative genius, when both sides of your brain work totally in tandem with each other! You can read more at my other site by clicking this link for brainwave synchronization. This gets your brain in the right place for flow. This 44 minute audio is my favourite. Basically you get the same meditative / flow effects as the original, but with the nice Zen sounds of rain over the top. This is a lot easier on the ears than the original MP3, and just as strong. Being a fan of a good deal, I went for this option. It contains all three recordings, plus a FREE Bliss Coded Music MP3. I've used all of them, and I'm very happy with my choice. If you can afford it comfortably, I highly recommend you go for this best-value option - it will keep you in flow for months and months! PS - If you're not sure, try them and just get your money back - it's quick and easy. Who knows - you might discover the very tool which can catapault you to success! I promise to use it only to send you awesome stuff that will help your brain! Copyright © Personal-Development-Planet | All rights reserved.